CFP Activities Around the World! A lot of delicious vegetables were made! This school is in Sabah state. 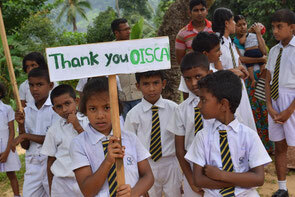 The school has continued activity positive with OISCA since 2013. 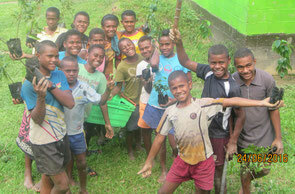 They have focused on Planting tree in the school and organic farming, 3R campaign. They were taught about rule of wasting separation by OISCA coordinator. My name is Siti. I am a third grade of SK Chi Vun Elemnntary School. I stay in dormitory usually because my house is one hour away from school by car . I hope to have lots of fruits. SK Ladang Sapong is located in Sabah state. There are no trees in the schoolyard and they were worried about exhaust gas. In 2017, They participated in the "CFP" with the desire to make the environment where children can concentrate on studying , and also want local people to be interested in the environment. Xilinhot No.6 High School is located in Xilinhot city in inner Mongolian Autonomous Region eastern part and there are 5,060 students. This school opened in 1993 and relatively new school. 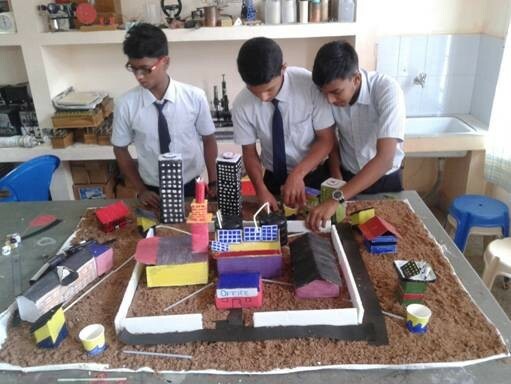 The school has done advanced education as model school of region. They are interested in environmental conservation and greening. 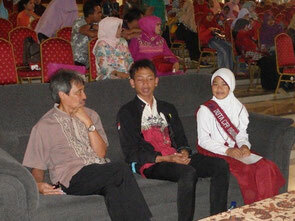 They focus on environmental education so that they are received recommendation by local government. School of Foreign Languages Shanxi Normal University is located in Northwest China in the ancient capital Xi'an. The University focuses on education. The university has English and Russian courses besides Japanese, and graduates are employed in Japanese companies in the northwest area. Every year, OISCA conducts a unique project named “Children’s Goodwill Ambassadors” under the Children’s Forest Program (CFP) inviting to Japan a few children from the Asian and Pacific countries for visiting various places related to forest development and environmental conservation as well as for carrying out exchange activities with Japanese children. 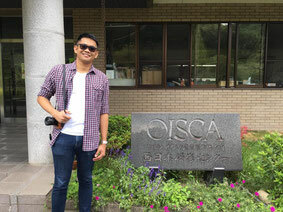 In October 2018, Mr. Jan Lester Bisco, a Filipino who is now working as a financial analyst in a communications company in Manila, visited Japan for the first time in 18 years. Yesagyo Township, Magway Region where DOA-OISCA Agroforestry Training Center is located, is in the harsh climatic conditions with the annual average rainfall of 500mm. Moreover, deforestation is progressing due to over-felling of forests for firewood. 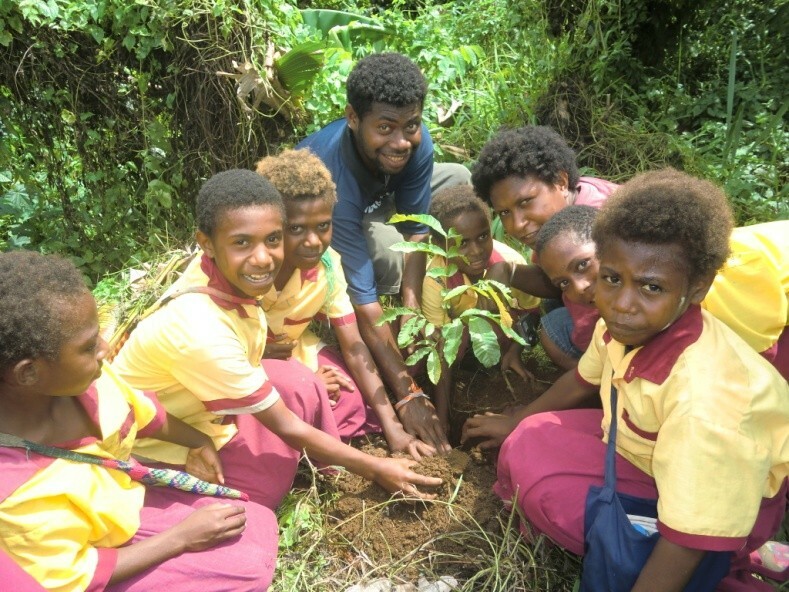 Against this background, OISCA, considering that teaching materials and opportunities for raising awareness of the youth on environmental conservation are lacking, has carried out for two years since January 2017 environmental education including tree planting activities in getting the support of the “Toyota Grant Program for Environmental Activities of Toyota Motor Corporation. 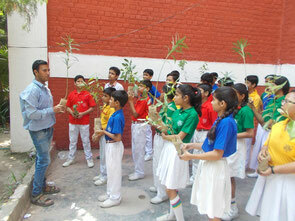 Before planting tree, presenting the significance of activities and lecture on how to plant trees. Let’s protect our FURUSATO (hometown) ! Tadsanab Watpaco School is Ayuttaya municipal school. Since the school is located near a river, the school premise is sometimes inundated when there is a large amount of water in the rainy season. Accordingly, the principal and teachers who recognized the need of environmental education including practical guidance at school consulted with OISCA and the activities started. 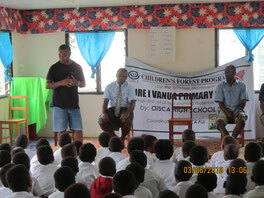 Before starting activity, OISCA and local NGO and School teacher hold the meeting. Fulbari School is located in a rural town of the southwestern part in Bangladesh. As there is a big river nearby, agriculture is thriving. On the other hand, the area is facing a problem of river flooding in the rainy season. In order to solve this problem and to raise environmental awareness of students, the school participated in CFP since 2014. OISCA trainees also helped the CFP activity. MI TARBIYATUSSHIBYAN Primary School is located in Desa Pasir Buncir village. Most people are farmers or bike/taxi drivers and they earn small income and are leading harsh daily life. Near the village, sand mining is thriving, but on the other hand there are some problems such as air pollution and water contamination. Although they had a large ground, they couldn’t make full use of it and didn’t have any knowledge or experience of using the ground effectively. Therefore, the teachers of this school have consulted with OISCA staff and they have started CFP. My name is Marie , and I go to Magapuy Elementary School in Nueva Vizcaya. I’m living in an agricultural place with wide rice and cornfield. Surround of My house is the beauty of the green color of rice and corn so I’m very proud of this beauty of my place and I’m also proud that my “Furusato (home town)” is a place where there is always a good harvest of rice and corn. Narly Pacheco Carrillo, a descendant of the Popolocan tribe She is tackling the CFP activities with the way of thinking taught by OISCA staff : “It is important to work oneself”. 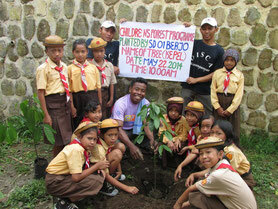 Presently, Children’s Forest Program (CFP) has been carried out in 36 countries and areas of the world. 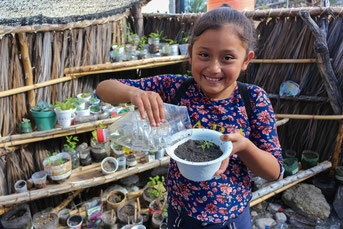 In Mexico’s Tehuacan-Cuicatlan Valley area, children are tackling CFP activities to protect the historical environment. In this area said to be the birthplace of Mesoamerica civilization, the valuable ecosystem of the North American semi-arid zone including various species of cacti is preserved and the area was designated as the World Heritage by UNESCO in 2018. OISCA members, CFP school's students and many friends participated actively in the Green Wave 2018! 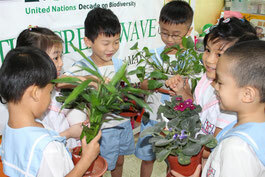 The Green Wave is a global biodiversity campaign to educate children and youth about biodiversity. Towards 2020, last year of the United Nations Decade on Biodiversity (2011-2020), the United Nations has been appealing more vigorously for its promotion worldwide. to Japan a total of 6 persons, 2 school children and a coordinator each from Abra Province, the Philippines and Khon Kaen Province, Thailand under the Children’s Forest Program (CFP). They visited Japanese supporting companies for exchange activities and observed various efforts for environmental conservation in Tokyo, Saitama Prefecture, Hokkaido and Miyagi Prefecture. Bure I Vanua District School is located in RA a province on the main island in Fiji. 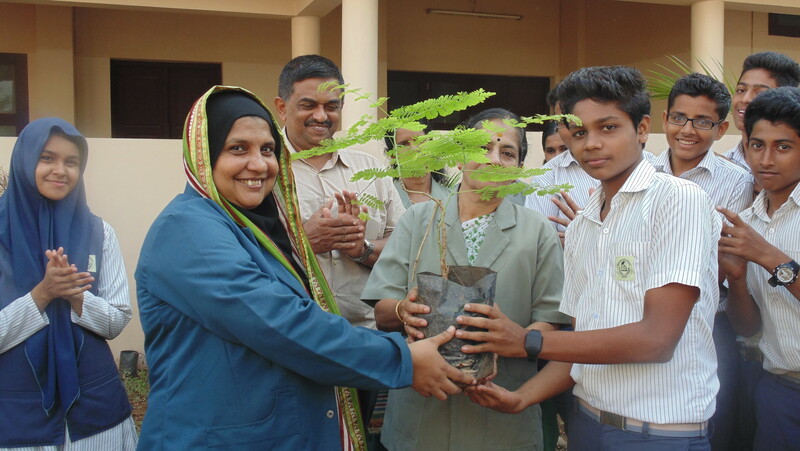 The school new teacher who had planted trees in another school, wanted to start planting trees with students in this school. Therefore the school has started CFP. The school is located in the rural area, so the students’ parents have a small income, and the nutritional condition of the students is not good. According by, in the first, they made chicken coop and started poultry raising program. By not only eating good meal but also raising chicken, they have learned the importance of life and feelings to appreciate food. 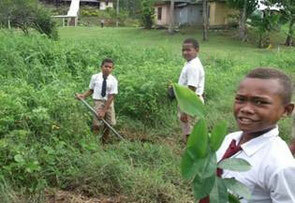 Nadroumai Primary School is located in Viti Levu Island and most of the students come from 5 surrounding villages. (Viti Levu Island is the main island in Fiji.) and they live in a dormitory. The school principal wanted to plant trees with students, so they joined the CFP in 1993.The school has carried out various activities for over 20 years and they have been doing new challenge with advices from the former students. It is a pioneer in CFP in this region. classroom’s roof leaks badly. They had a large ground but there were no tree and no shade which protect the children from the hot weather in dry season. That’s why they requested OISCA to start the CFP. 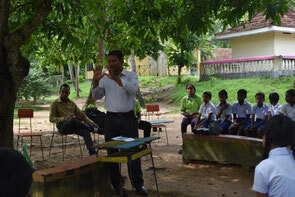 Before planting trees,OISCA staff lectures to students about the meaning of activity and how to plant trees. Toul Meas Primary School is located in a rural area about 38km away from the capital of Kampong Cham Province. The School had wide schoolyard with fertile soil, but there was no tree and no shade for children to rest. 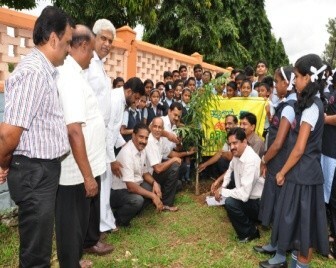 The school principal wanted to plant trees with students and promote awareness program for environment conservation. That is why the CFP activity was started in this school. 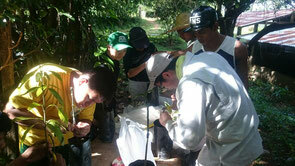 Recently, OISCA Sabah in Eastern Malaysia organized a series of tree planting events. 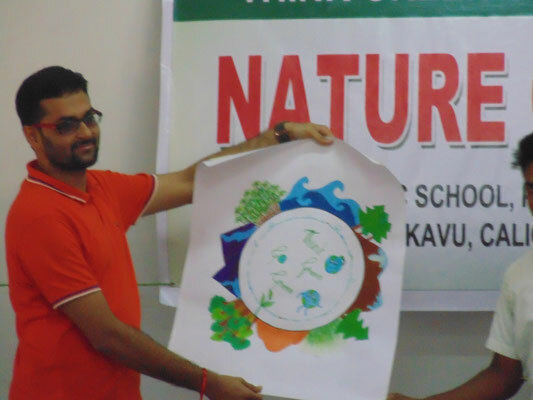 The first one was held on the afternoon of April 25 at Kungkular School and was joined by about 40 people including school teachers, parents and OISCA trainees. 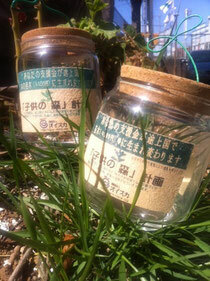 The participants planted herbs and flowers. Since the land area of the school was of red soil, they had to apply some compost before planting. 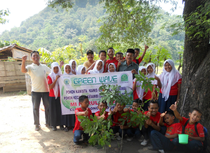 The Green Wave is a global biodiversitycampaign which the Secretariat of the Convention on Biological Diversity (SCBD)of the United Nations has advocated and is calling for participation in greening by young people. It is celebrated globally before and after May 22 –the International Day for Biological Diversity. 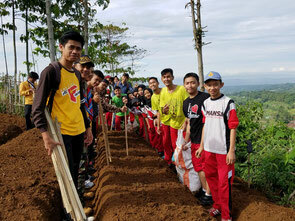 OISCA concluded in 2016 a basic agreement with SCBD for promoting conservation of biological diversity and PR activities, and has been carrying out tree planting activities mainly through schools participating in the Children’s Forest Program (CFP). 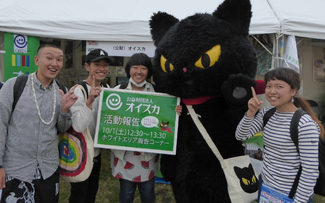 This year, it actively conducted the Green Wave campaign in Japan and overseas. When awareness changes, behavior also changes ! 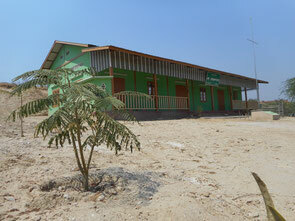 This school is located in Yezagyo Township of the central arid region. As the area is close to the Chindwin River, plants can grow easily compared to other areas. The villagers are engaged in farming and are growing mostly beans. They started CFP activities in 2007. In 2016, they planted Neem which can also serves as medicine, Siris which grows fast and Gold Mohur which provides good shades with widely spreading branches. The school is located in a mountainous community that has a famous water rafting spot. It joined CFP just in March 2017. 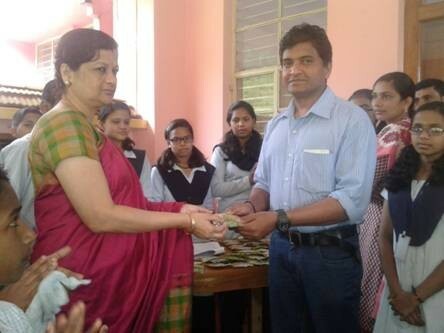 The principal of another CFP participating school moved to this school and requested OISCA for starting CFP activities. 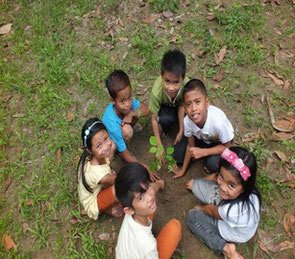 In the first activity, they planted 65 seedlings of mainly fruit-bearing trees such as Pomelo, Mangosteen and Langsat. The children are looking forward to seeing that the seedlings they planted would bear fruits. 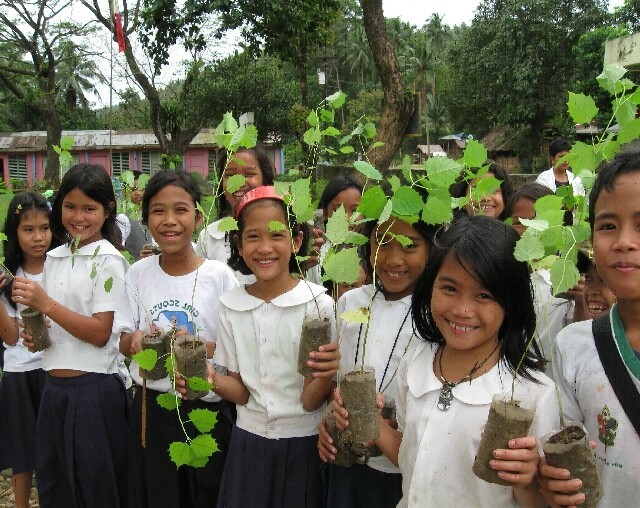 Grasecencelly Pilineus, 12-years old students, said that she was very happy in the actual tree planting activity because it was her first time to do it. 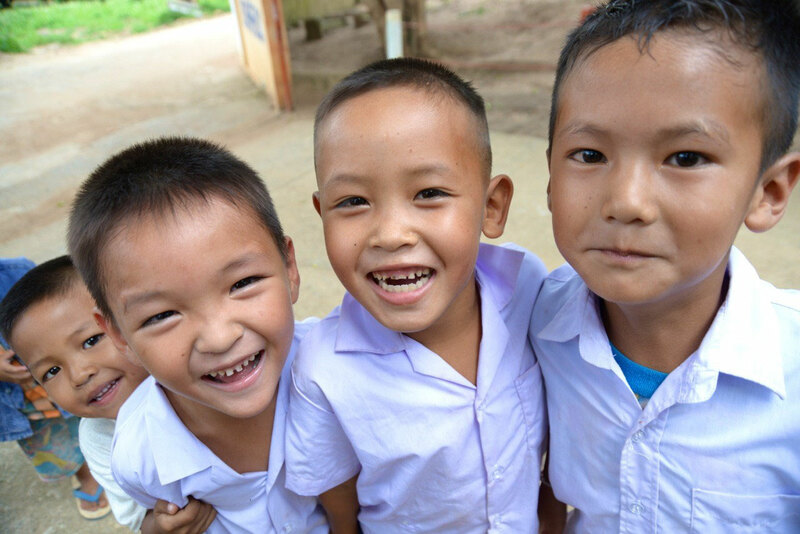 The school is located 2 km away from the village and is surrounded by rice fields. 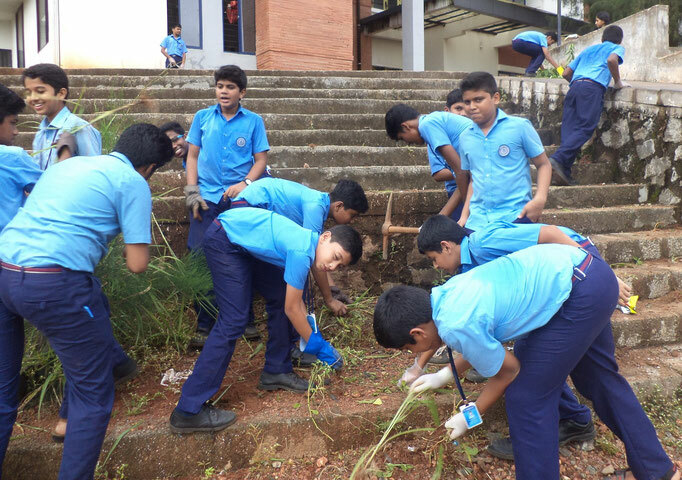 The whole school is carrying out environmental protection activities, and the participating students are enthusiastically taking care of the seedlings planted. Thanks to the daily efforts of the children, the 110 seedlings planted in 2016 are growing well. 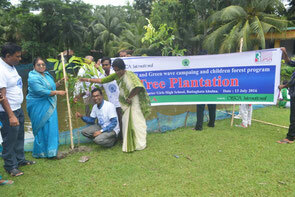 They planted such trees as Afzelia Xylocarpa, Cassia Fistula and teak. 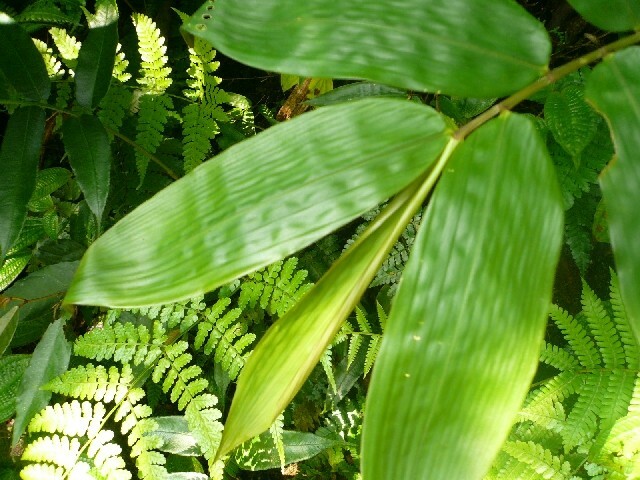 Afzelia Xylocarpa is almost gone because of deforestation. 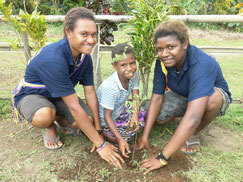 Through planting these local tree species, the children are recognizing the original richness of nature. 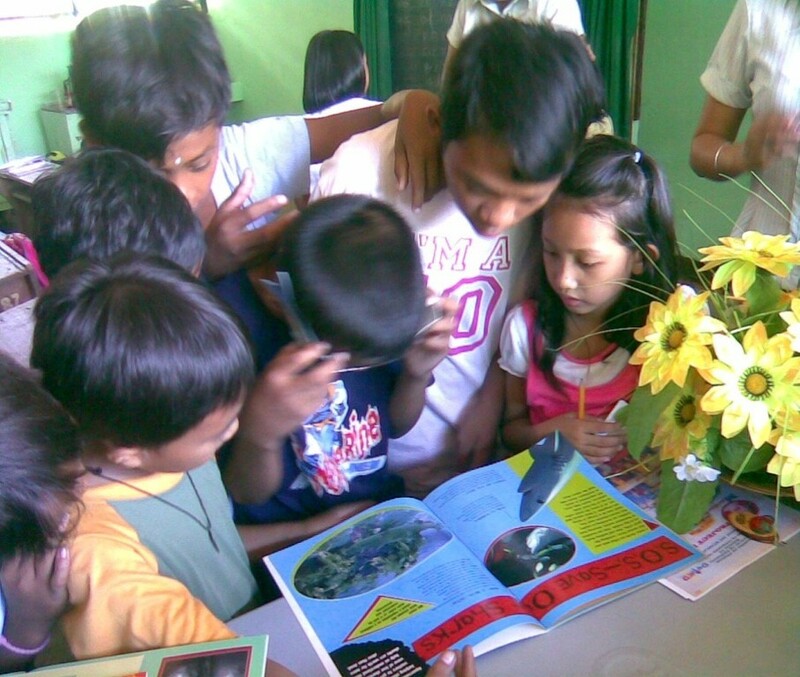 SDN 2 Ngemplak is an elementary school with 114 pupils located in Karanganyar, Central Java Province. In this school which is taking part in CFP since 1993, the trees planted by school children are steadily growing and providing cool environment with shades. As they are carrying out activities in close cooperation with the local community, they could utilize the land owned by the village as a planting site and have developed it as a small forest. This school is located in Compostela Valley Province located in the southeastern part of Mindanao Island, Southern Philippines. 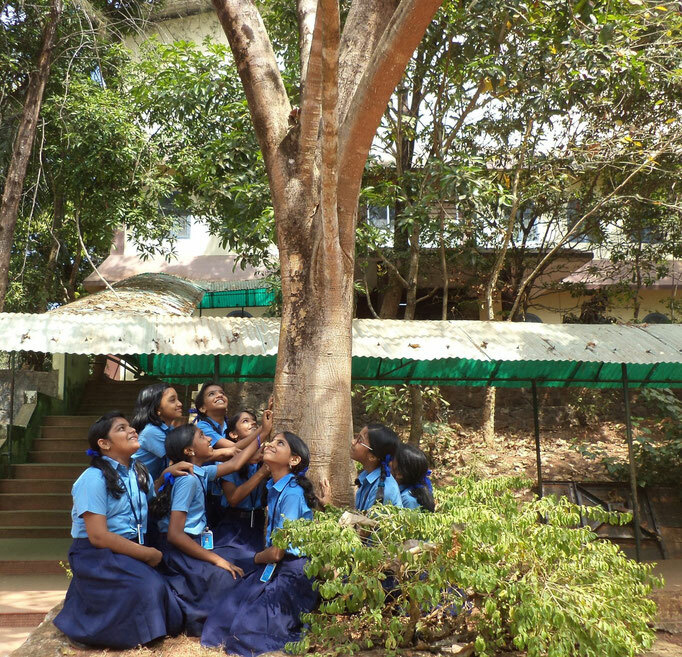 The school decided to start CFP activities in 2016 in the hope that the students would be able to have a better place of studying and playing, and also trees would give them clean air to breathe. This school is located in a peaceful countryside about 5 km away from the national road. Since it is on the high ground, there is no flooding damage even during the rainy season. 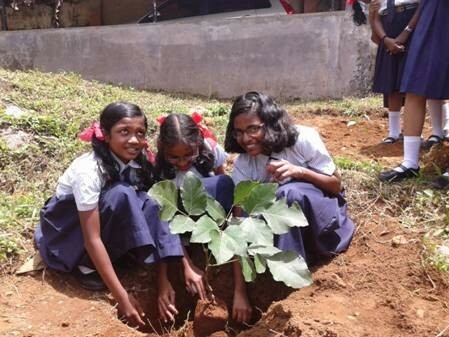 There are no trees for shade in the schoolyard, and CFP activities started in 2016 in the wake of the call by the school principal for planting trees. Pleasantly practicing delicious vegetable growing! This school is located in the rural area away from the city. 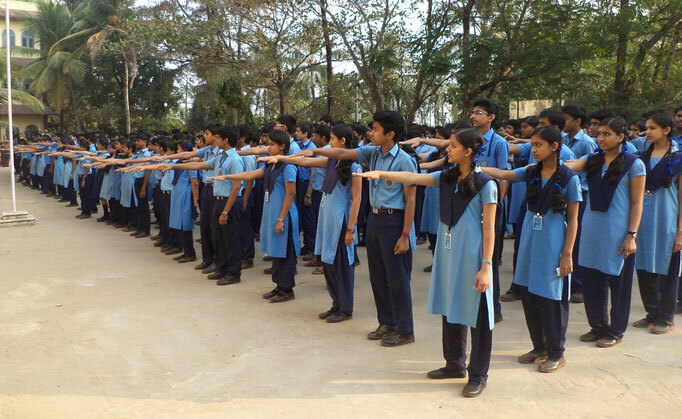 The school has carried out various activities for over 20 years since it joined CFP. 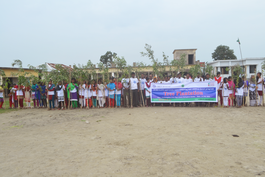 In recent years, it has conducted tree planting focused on fruit bearing trees, the nutrition source for children and also ornamental trees for beautification of the village. The parents of school children are mostly engaged in agriculture, but the children don’t really know the harmful effects of fertilizers and agricultural chemicals used in agriculture. 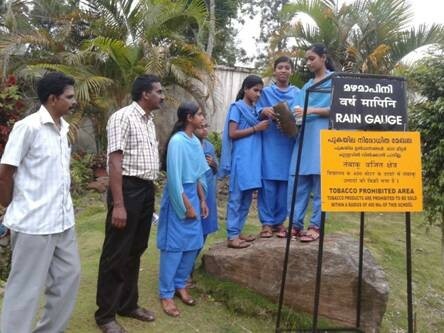 In this school located in the heart of Alashan, they are putting effort on environmental beautification. The area is dry highlands with annual rainfalls of 400mm, only one-third of Tokyo and the average temperature in winter is minus 11 degrees Celsius. The surrounding area is desert where plants are sparse. 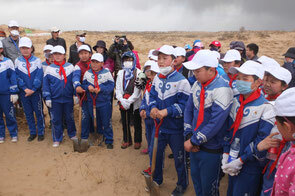 As there are many children who have no experience in tackling anti-desertification, the school joined CFP to carry out practical environmental education. 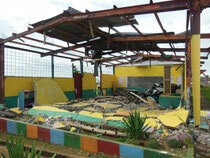 The school is located in the rural area which is recognized by the government as part of the conservation area. For this reason, illegal logging is strictly controlled and the conservation of forests is strongly promoted. 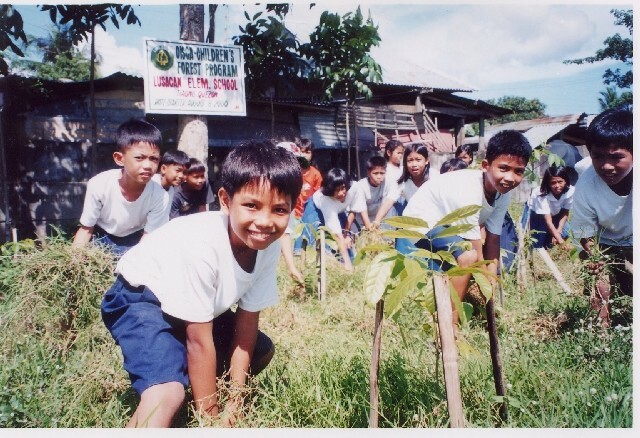 School children are also very interested in protecting trees, and it is recognized by the government as a school actively involved in environmental activities. 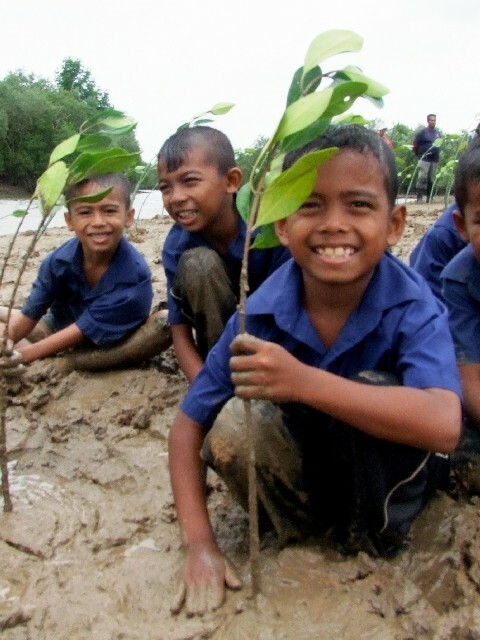 In 2016, they planted teak and germelina, and held an environmental workshop to tell the children about what sort of impact tree planting would give to global environment and also thought together on what they would be able to do for the environment. This school is located at Ganthiriyawa Village near the central part of Sri Lanka. 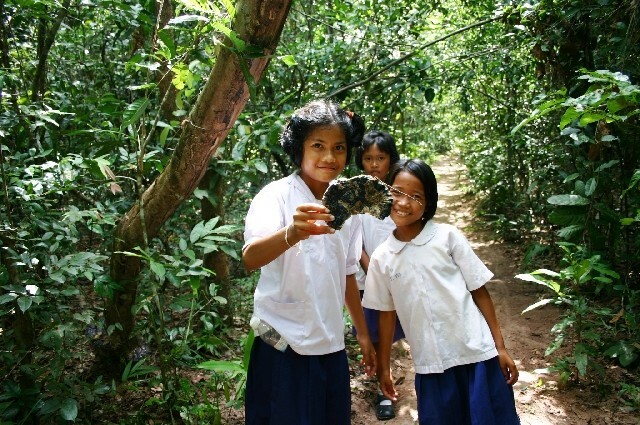 The school joined CFP in 2016 with a view to restoring the previous rich forest and revitalizing environmental conservation activities at the school and in the community. OISCA coordinators held a series of pre-briefing sessions on the significance of the activities first to the principal and teachers, then to the local residents and children. After getting their understanding, full-fledged activities started. This school is a large school with 1,200 students located in the eastern part of Xilinhot City, Inner Mongolia. 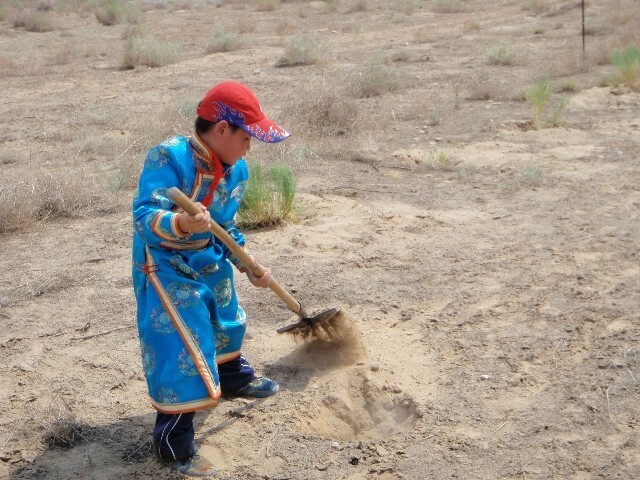 Since the school is for the ethnic Mongolian people, the students are mostly children of nomads and very sensitive about the desertification problem which is directly related with their family business. 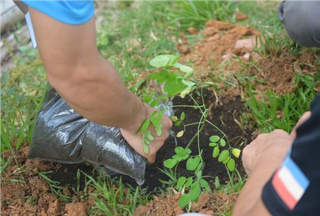 The CFP activities started in 2014 in the strong hope of improving the local environment. In the past, the activities have focused on environmental education such as seminars, but in 2016, they planted shrub named Salix psammophila effective for preventing dust. 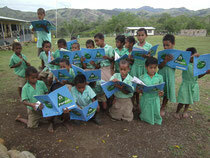 This school is located in the mountainous area in the Viti Levu Island. It joined CFP in 2016. 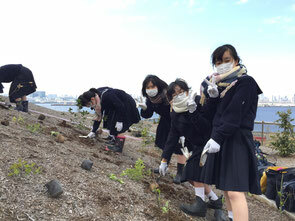 In the first activity, they planted local tree species. 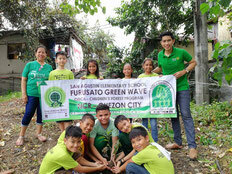 Through these practical activities, they are hoping that children would come to know the rich nature of their FURUSATO and would be able to take an action for the conservation of the disappearing local tree species. 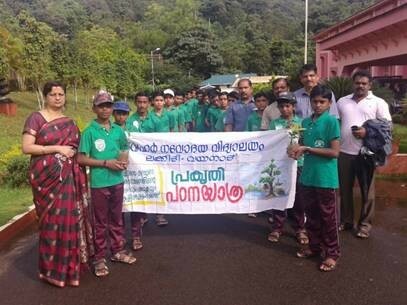 This school which joined the Children’s Forest Program (CFP) in 2016 carried out activities raising the slogan “Let one person plant a tree and take care of it throughout the year”. On July 13, 100 students and 11 adults together with representatives of the local NGO: RUSA (Rural & Urban Problem Solve Association) and government officials planted 100 seedlings of mahogany and other species. 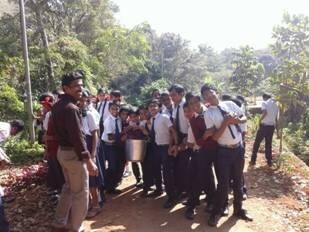 In the tree planting, the students and adults all got excited just like in a festival. 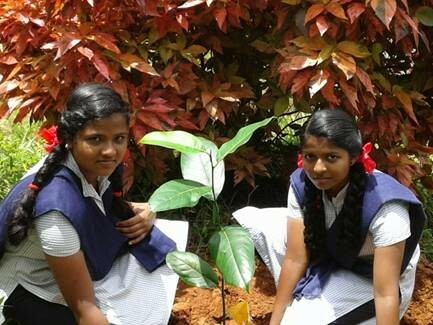 This school participated in CFP in 2016 with the hope of protecting children from natural disasters by planting trees around the school. The sense of crisis for an increasing number of disasters in recent years fueled to join the activity. In the first activity, they planted hardwood species to be used as timber and fruit bearing trees. 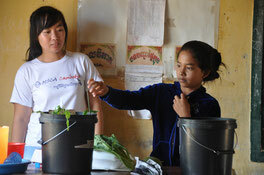 By growing fruit bearing species, they can sell fruits to earn income for school. This school is small with only 36 pupils. Previously it was located in a village close to the major river. But due to floods and landslides, the villagers had to evacuate from their former residences and moved to the present location. The school also moved from the river side, and was rebuilt in 2016 with the help of OISCA members and other Japanese donors. This school is located on Palawan Island, Southwestern part of the Philippines. It is along the highway, but the beautiful sea is nearby. 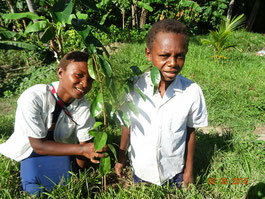 Around the school which joined CFP in 1997, there are growing trees planted by school children. 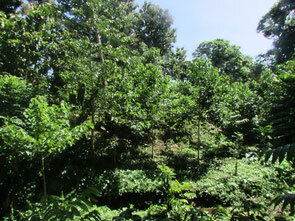 Some years ago, they experienced floods due to heavy rains, but the grown trees mitigated the disaster damage. 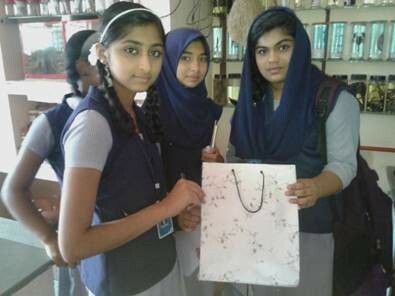 This school which has 162 students is located in Khulna, the third largest city in Bangladesh. It joined CFP in 2016, but until then, the students were not so interested in environmental activities. The teachers, however, felt a sense of crisis over the natural disasters which frequently occurred in the country in recent years and started activities in the hope of minimizing damage even a little. 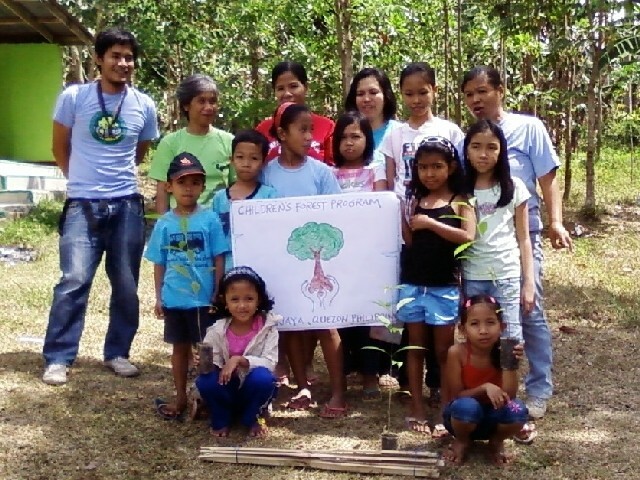 Recently, OISCA Sabah in Eastern Malaysia organaized a series of tree planting events. 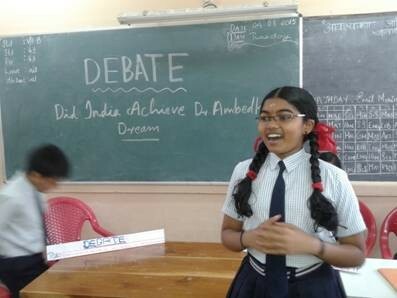 The first one was held on the afternoon of April 25 at Kungkular School and was joined by about 40 people including school teachers, parents and OISCA trainees. 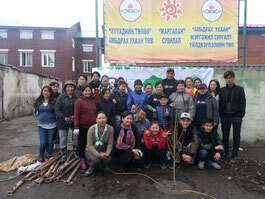 The participants planted herbs and flowers. Since the land area of the school was of red soil, they had to apply some compost before planting. On October 1 and 2, OISCA participated in “Global Festa 2016” held at the Odaiba, area in Tokyo. It is an annual event in which governmental agencies, private organizations and groups dealing with international cooperation present their activities and celebrities perform on the stage. This year, OISCA exhibited at its booth photo panels on the worsening environmental problems and natural disasters in foreign countries where OISCA is operating, organized a quiz program on these topics and photo-taking sessions with “Kurocchi”, huge-sized doll of stray cat which is the mascot of the Children’s Forest Program (CFP). 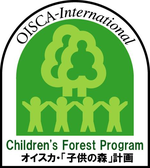 From September 14 to 24, OISCA invited to Japan a total of 7 school children and coordinators from Myanmar and Mongolia under the Children’s Forest Program (CFP) and carried out various exchange activities in Tokyo, Aichi, Osaka and Nara. The Green Wave, OISCA has joined since 2008, it is promoted by The Secertariat of the Convention on Biological Diversity (SCBD) . The new CFP logo which cerebrating 25th anniversary of CFP were shown in Indonesia CFP schools and flying that flag. That logo has wishes for "water, green and protect the future". Along that meant, children were tought "planting trees make conserving water cleanly and protect livings its lives and make the happiness future". After this education, children seems start to have more passionate attitude to participate CFP project.OISCA also took lots of actions involving CFP schools mainly with many participants in Japan and other countires.A lot of activities concerning greens were taken actions all over the world around on May, 22th, the international biological diversity day. OISCA LANKA CFP 25th anniversary activities in April, 2016. Before the tree planting children had explanation on how to plant saplings and the importance of the Tree planting by CFP Coordinator Mr. Jayamanna. During tree planting, they met very dangerous snake in planting site but they had really interesting, funny and unforgetable time. 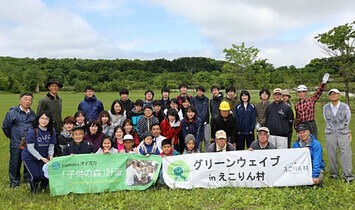 On March 26, OISCA co-organized in Tokyo the “Green Earth Festival 2016” in cooperation with the National Land Afforestation Promotion Organization, the Forest Culture Association, NPO Forests and Environment Network Association, and the Forestry Agency, Ministry of Agriculture, Forestry and Fisheries. The school was built in 1992 for orphans and street children. The school`s training programs include teaching the students to learn how to cook, process food, construction, agriculture and animal husbandry. The school also offers secondary education program. 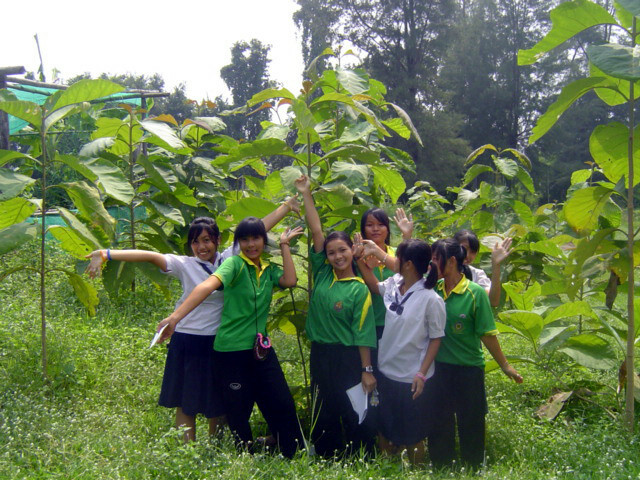 In 2014, OISCA introduced the concept of the Children`s Forest Program (CFP) wherein the students planted poplar and lilac tree seedlings within the school compound. After two years, the all planted seedlings are growing well. After the school`s establishment in 2007, the students whose ages are ranging from 6-11 years old no longer need to walk for about an hour just to go to school. The playground is often taken for granted because of the absence of vegetation. To increase the vegetation cover of the school, OISCA began to introduce the concept of the Children`s Forest Program (CFP) in 2015. 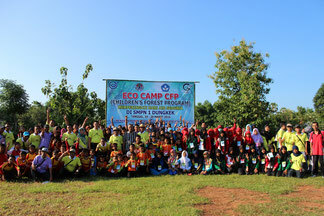 The 2nd annual eco-camp event in Sumenep Regency, Madura Island was held in March 19th – 20th, 2016 at Dungkek Junior High School in the same regency. It was attended by 173 students from 6 CFP schools and 4 non-CFP schools. Students were accompanied by two teachers from every participating school. The eco-camp was conducted to commemorate two important international events, which were the World Water Day and the International Day of Forests. Thus, all activities were related to these themes so that students could learn and understand the relationship of water to trees. Such examples of activities carried out were lectures on waste management, water as source of life, relationship of sea and mountain which were provided by the Environment Office and CFP national team. Fakha, CFP Ambassador, also shared the experience and knowledge he learned during his trip to Japan. 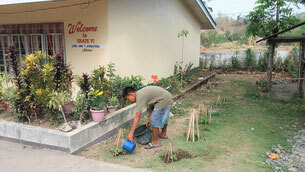 Others were planting of 205 seedlings and station activity. The aims were to instill in children the appreciation for water and its source, discipline in garbage management and love for tree planting. KYAWE MONE (The Mirror), a national paper in Myanmar carried the following article on 9 March 2016. The following is a translation from Myanmar language (abridged). 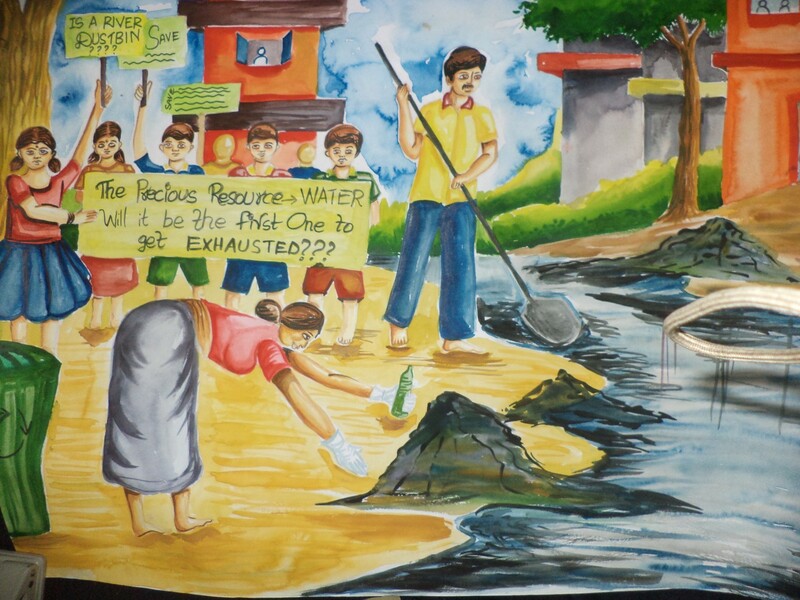 Today we are faced with many environmental problems including climate change, extinction of species etc. Biological diversity is being lost, and eco-systems are being destroyed. The world community needs to tackle the crisis. Otherwise, it would worsen day by day. Tree planting is the most urgently needed task for human beings. The world is losing forests at an alarming speed. So, the Children’s Forest Program (CFP) is now being introduced. CFP was started in 1991. 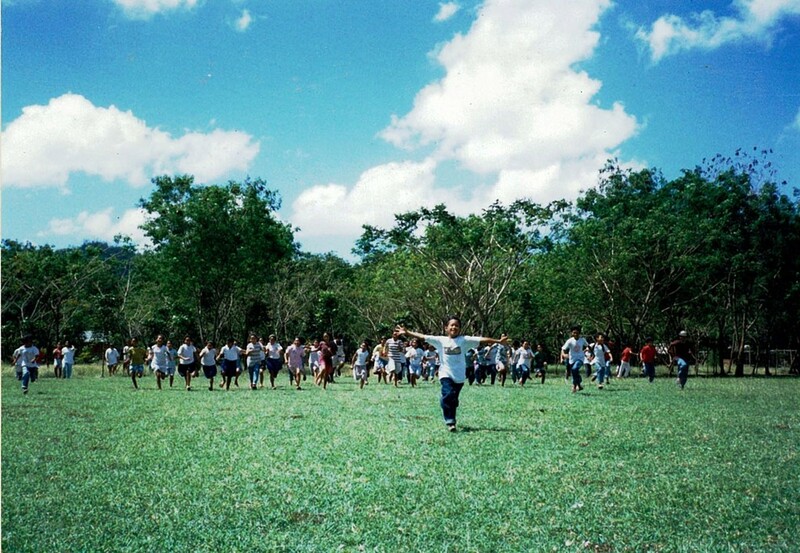 OISCA, an NGO established in Japan in 1961, initiated this effective environmental education program. CFP is now spreading to 32 countries (*the article was written on the data collected in 2013). Myanmar is one of the countries, and CFP was introduced in Yesagyo Township, Magway in 2001. 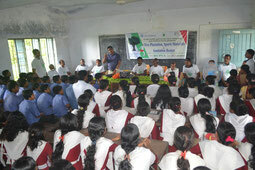 At present 60 schools in Yesagyo are taking part in this Program. Ms. Utami Fauziah, a 12-years old elementary school pupil from Sukabumi, West Java, Indonesia, who was one of the participants in the 2015 OISCA Program for CFP Children Goodwill Ambassadors in Japan, has been playing an active role in various events related to the environmental conservation in the home country.At a report meeting held at her school after returning from Japan, she told her classmates and teachers about the experience and learning acquired through the program in Japan. As the most impressive points, she enumerated that since separate collection of garbage and recycling have been widely practiced in Japan, cities and towns are clean and beautiful without trash on the streets and that for developing forests, it is very important not only to plant trees, but also to make a cycle to cut down trees and effectively use them. As practical recycling activities, together with her schoolmates, she has been tackling craft making by utilizing scrap wood, and some of their works are now displayed at school. 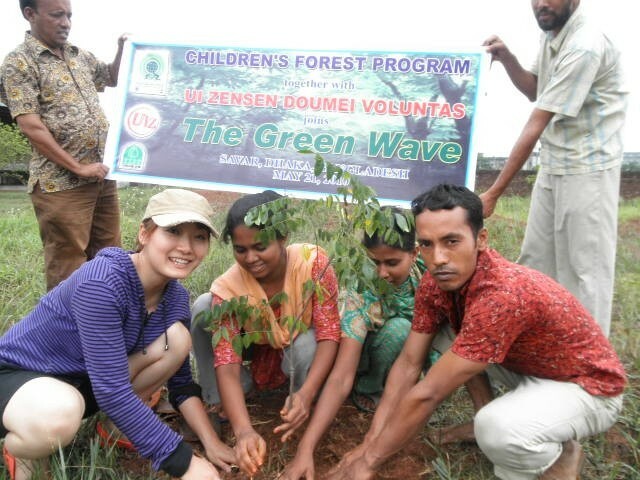 This year also, we connected “green waves” in various places ! 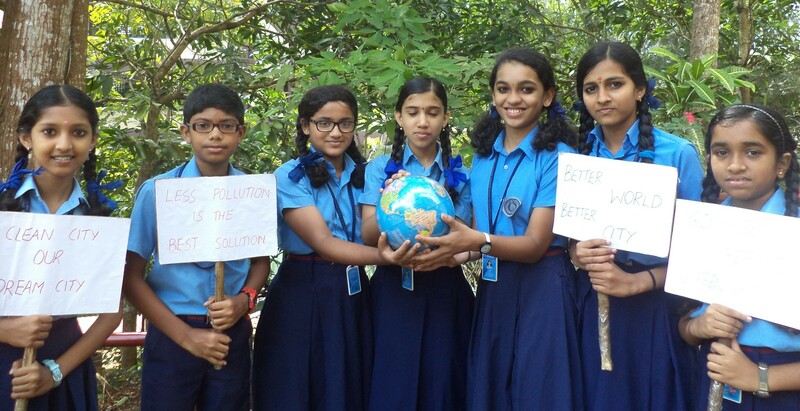 In 2015, the pupils and students of the schools participating in OISCA’s Children’s Forest Program (CFP) joined the Green Wave campaign. 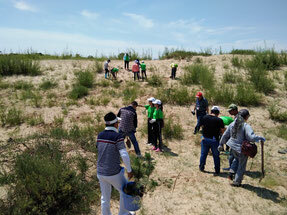 At 10:00 o’clock on the morning of May 22, they took part in tree planting in the various parts of the world to create “green waves” on the planet. 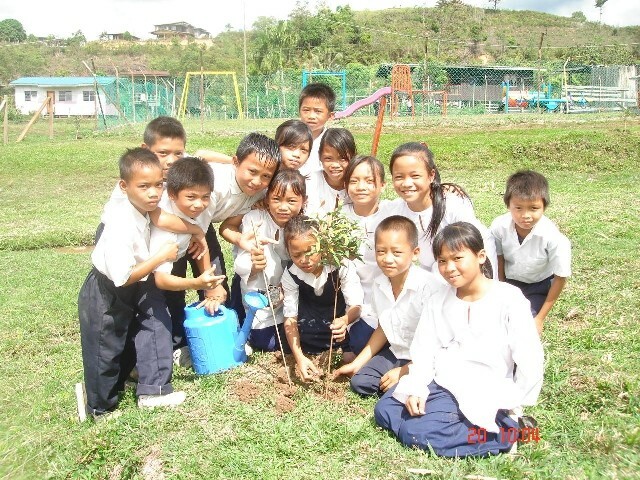 At Banchoktai School in Thailand, 4 organizations including the school gathered and a total of over 50 children carried out tree planting and learnt about the global environment, living creatures and the importance of protecting Nature with their own force. OISCA took part in the “Eco-Products 2015” held at Tokyo Big Sight (Tokyo International Exhibition Center) from December 10 to 12, 2015. The eco-products exhibition featuring environmental technologies and environmentally-friendly products and services is held annually since 1999 and is known as one of the largest exhibitions of its kind in Japan. The visitors numbering about 169,000 persons comprised representatives from private corporations, industrial and commercial organizations, national and local government agencies, environmental NPOs and NGOs and general public with interest in environmental issues. Learnt abaout Japan's Nature in Nara Prefecture. From October 19 to 30, 2015, a group of Indonesian and Thai children came to Japan as CFP Children Goodwill Ambassadors. The children visited Osaka, Nara, Aichi, Gifu, Shizuoka and Tokyo, and learnt about Japan’s Nature and efforts for conserving the environment while carrying out exchange programs in the various areas. 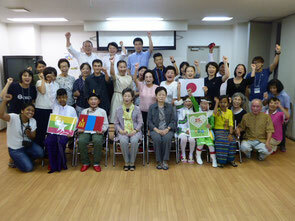 They first visited Yoshikawa Elementary School in Toyonoo, Osaka Prefecture, and introduced to the Japanese children the cultures of their respective countries through presenting songs and dances and at the same time, enjoyed an exchange program through Japanese traditional plays and joint drawing of pictures. On October 22, the CFP Children Goodwill Ambassadors visited the Osaka ATC Green Eco Plaza and observed the approaches of private companies towards the environmental problem and the exhibition of the latest technologies. On 25th November, 2015, Children's Forest Program (CFP) Coordinators from 8 countries and areas have gathered together at OISCA Youth Center in Calicut ,Kerala, India. This autumn, two groups of Japanese university students interested in international cooperation carried out field training in agriculture in the Philippines and Fiji. From September 15 to 22, 5 students from the Faculty of International Agriculture and Food Studies, Tokyo University of Agriculture, went to the Philippines for practical training at OISCA Abra Agro-Forestry Training Center located in Northern Luzon. They experienced grafting of tropical fruit trees, taking care of farm animals such as hogs, cows, goats and chicken, fertilizer application in rice paddies and vegetable seeding. They also had exchange activities with children at the local schools participating in the OISCA Children’s Forest Program (CFP). KPD/OISCA Training Center took the initiative to introduce the concept of CFP in SMK Elopura 2 in Sandakan, Sabah on April 10, 2015. Sandakan is located at the east coast of Sabah and is 7 hours drive by car from Tenom where the training center is located. Spearheaded by Ms. Azlinah Muhamin, CFP Coordinator, the event was joined by 110 participants including the school teachers, volunteers, KPD/OISCA staff and trainees and the 60 students from the 5 different schools of Sandakan. 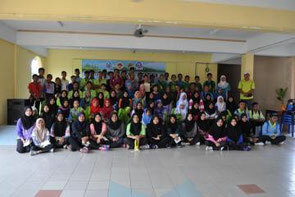 It was also joined by the students of SMK Muhibah which is a special school for the children with learning disabilities. 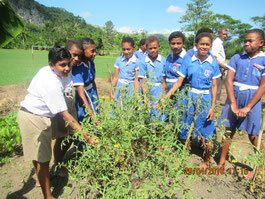 On May 22, proclaimed by the United Nations as the International Day for Biological Diversity, the Green Wave activities in which the Secretariat of the Convention on Biological Diversity (CBD) has been appealing for worldwide participation, were carried out in five schools in Fiji (Ratu Nemani Memorial school, Ratu Latianara Memorial Primary School, Nawai Public School, Nokonoko District School and Ratu Ilaisa Memrial School). 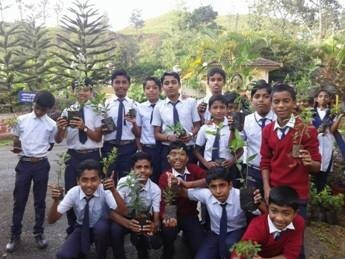 In the respective schools, a large number of pupils and teachers took part and conducted distinctive tree planting programs. 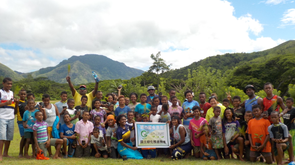 About 750 students of Deum Kokoh Primary School, Damril Primary School and Damril Secondary School joined the environmental workshop and the planting trees. They learned how to separate garbage or pant the trees in the workshop. After that, they planted about 550 trees. OISCA International and OISCA Hong Kong in cooperation with the Yuen Long Town Hall, Hong Kong organized on May 29, 2015 “Green Wave 2015 & Partnership Ceremony”. The event held at the Yuen Long Town Hall was attended by about 200 people including children from the 9 local schools participating in the Green Wave campaign and also officials from the Development Bureau of the Government of the Hong Kong SAR (Special Administrative Region) and representatives from educational organizations. The participants made presentations on their activities and exchanged views on future programs. 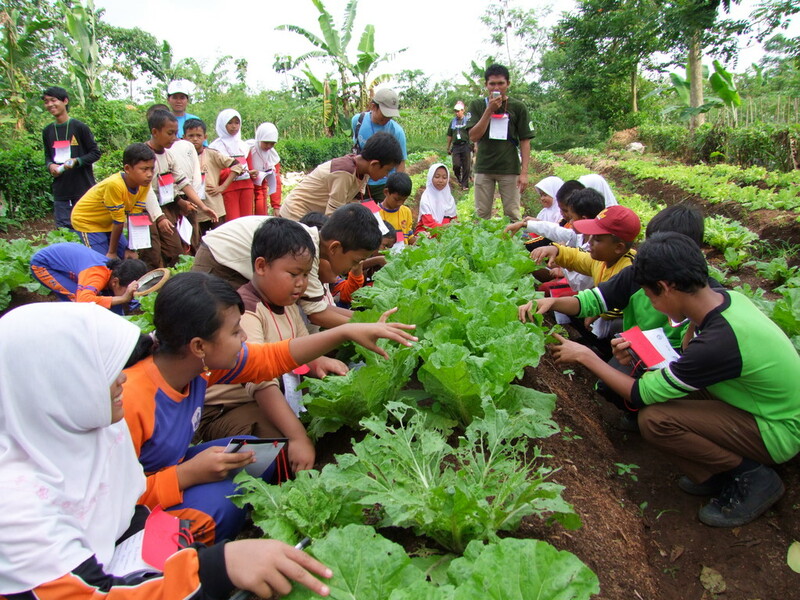 On March 21 and 22, OISCA Indonesia organized eco camp of the Children’s Forest Program (CFP) in Madura Island, East Java Province, and 150 school children and teachers from 10 primary and secondary schools in Sumenep and Pamekasan Regencies participated in the event. 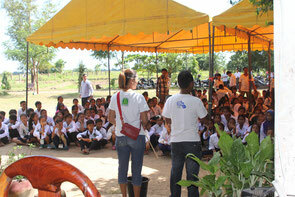 The camp was held to commemorate the “International Day of Forest” on March 21 and the “World Water Day” on March 22. On Madura Island, serious water shortage in the dry season and massive floods in the rainy season occur mainly because the terrain is mostly flat with poor water retention capability and forestation is not in progress. In the face of the frequent natural disasters, it has been the major challenge to conserve the water source environment. 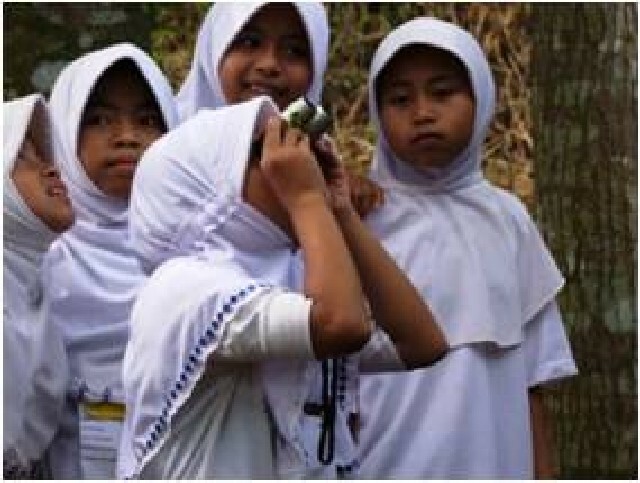 With the financial support from the National Land Afforestation Promotion Organization, OISCA started in 2014 “Project of cooperation with schools and communities for the conservation of forests and water” with a view to promote knowledge on forests and water conservation, to fundamentally improve the environment and to develop sustainable communities. 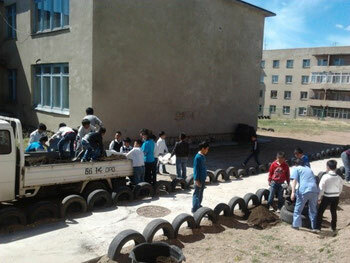 The eco camp was carried out as a CFP activity which forms part of the project. Through seminars and outdoor workshops, the participating children learnt about environmental problems of their own communities, water circulation in nature and biodiversity. 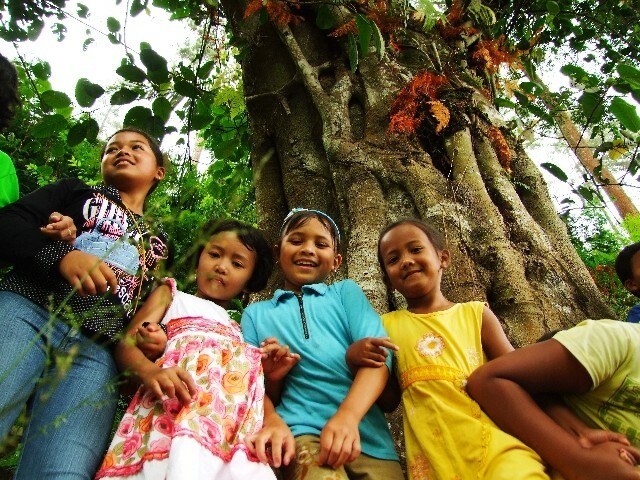 The children said they understood well that protecting forests leads to protecting water and would like to continue tree planting so that their communities would be revitalized with green and rich land. By fostering the children’s awareness and also involving the local residents, OISCA intends to promote the development of human resources who can take initiatives. 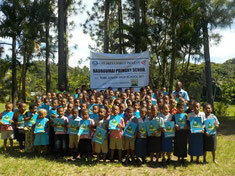 On February 5, CFP activity was conducted at Raunitogo Primary School which is located in Sigatoka, Nadroga-navosa, Fiji. 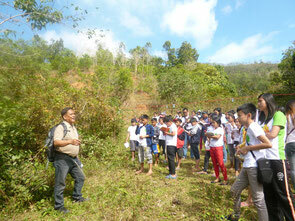 Students were divided into two groups and one attended tree planting activity. 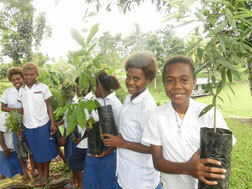 33 seedlings including coconut, mahogany, lemon and so on were planted. OISCA USA started the projects by introducing an international species to the historical borough of Raritan. 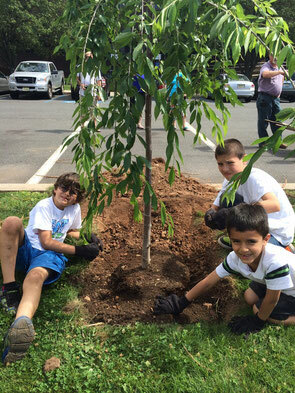 Japanese cherry blossoms were planted by Raritan’s main town building for all of the community to share and appreciate. 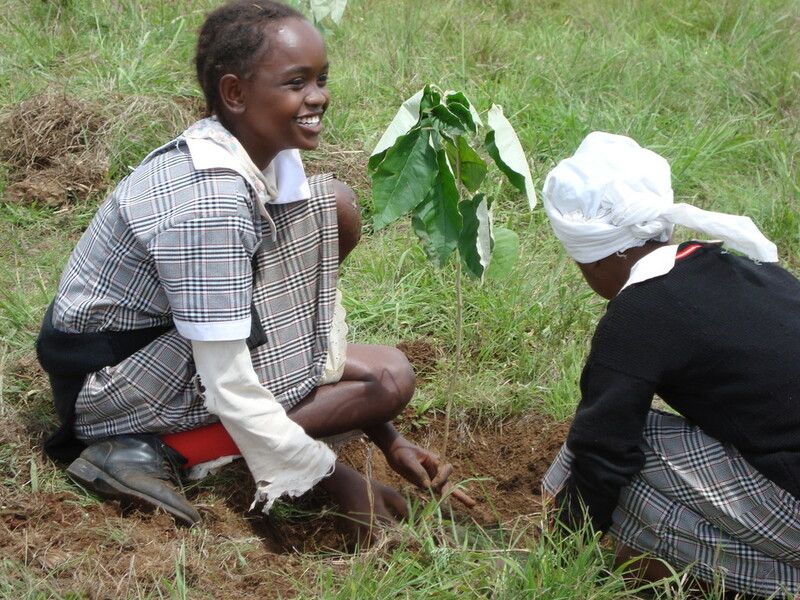 The matured tree seedlings were planted by grade school children who were extremely excited to plant the first of many trees in their lifetime. 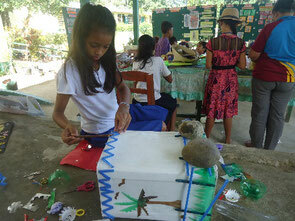 The children and families were eager to be a part of simple and sustainable projects. OISCA USA inspires the community to practice natural beauty, organic maintenance, and deep appreciation for the future of the young generations and the planet earth. 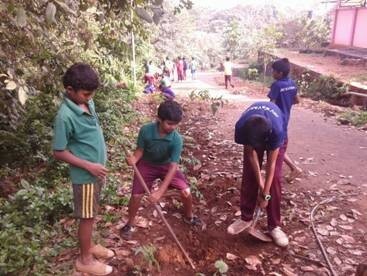 In South India, 75,000 students in 1,725 schools have joined the CFP activity and the total number of saplings planted comes around 100,000 every year. 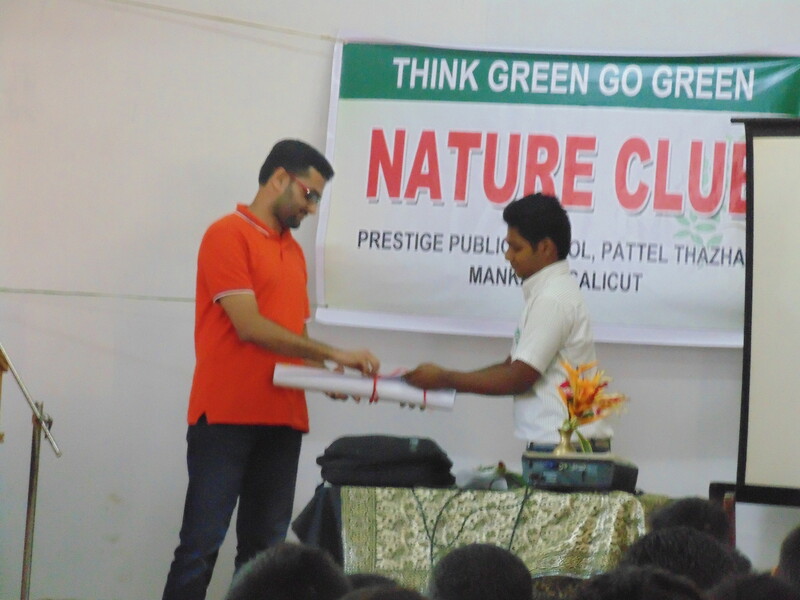 Love Green Clubs, the basic unit of CFP, were established in schools. 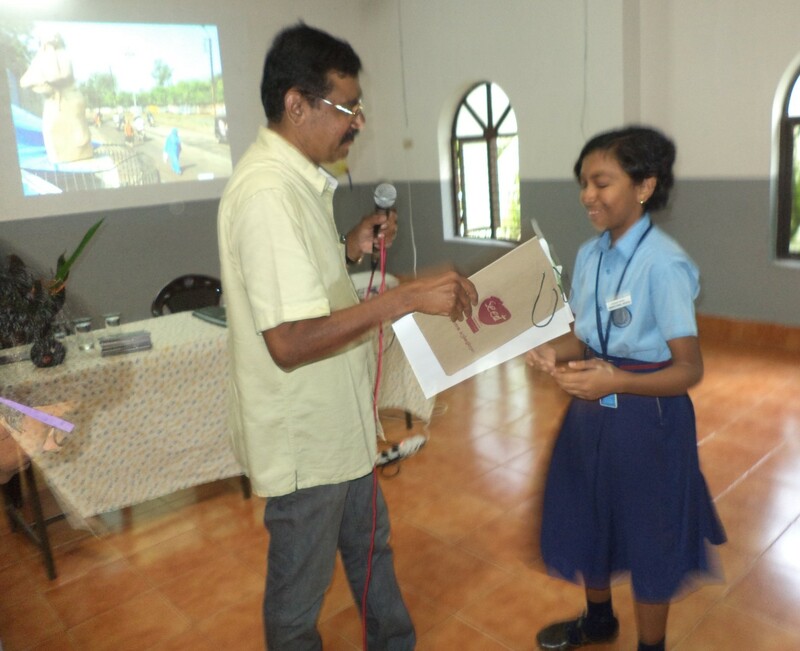 Various types of education programs and competitions are conducted and study materials were distributed to the children to encourage them learn more about environment. 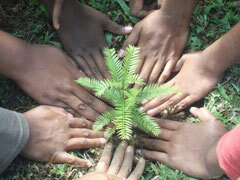 It is estimated that more than 2,900,000 saplings were planted throughout South India during the last 28 years. Also, the reunion meeting of International Educational Exchange Program (IEEP), which started in South India in 2001, was held at OISCA Youth Centre on 7 December. 12 students, 4 ex trainees and some parents of old boys participated in this event. Students explained about their activities and shared their desire to associate with OISCA activities. They have decided to conduct this event every year and the first batch students will coordinate this OISCA Alumni Association of South India. 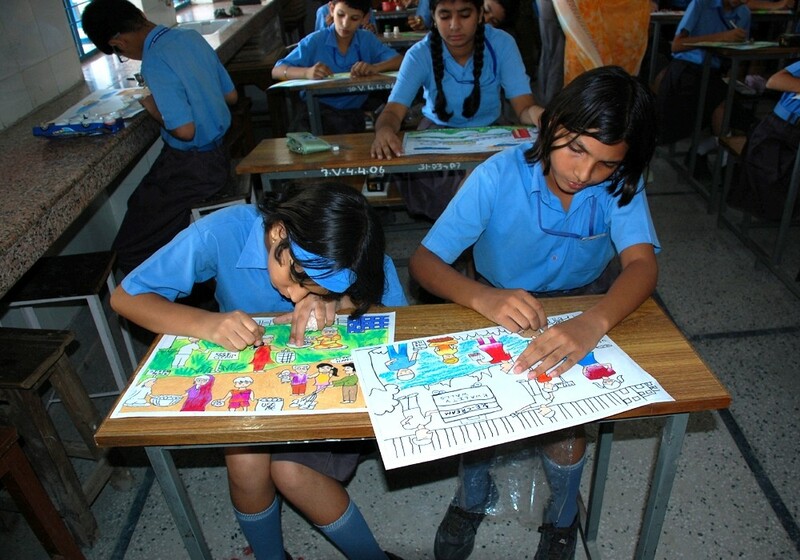 OISCA North India has implemented CFP in 1000 schools in 5 states of North India covering rural and urban schools and Government and Non Government schools. 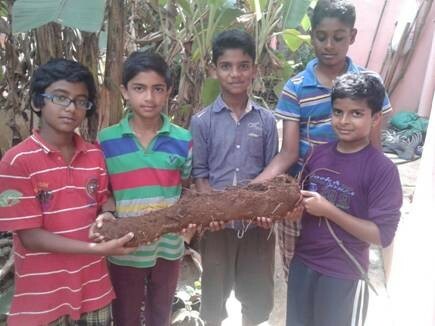 For the plantation drives, saplings were distributed to students to encourage them to plant in their homes and communities and about 50,000 saplings have been planted. 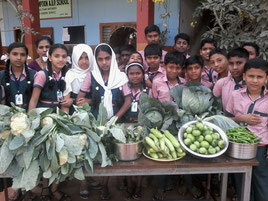 Children are learning about what is "Okura" vegetable. The trees planted at the Ramon Rosa Primary School as CFP have grown over twice as high as children’s height of grade 4 after two years, and children all look very happy to see the growth of the trees. 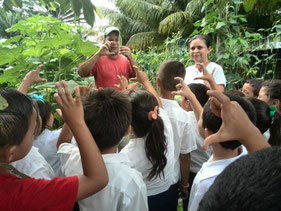 In addition, Mr. Fernando Mancia, OISCA Chubu Training Center's former trainee, also started to teach children about vegetable cultivation at the backyard of the school. 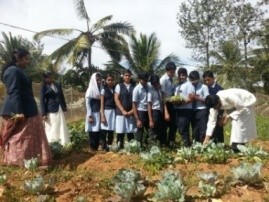 Through this activity, they can learn not only how to grow their food but also how to enjoy with the natural blessings. 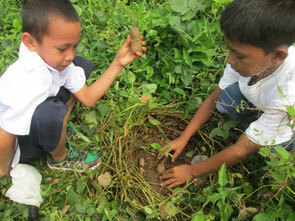 Though taking care of trees and vegetables, children are leaning about nature and environment. 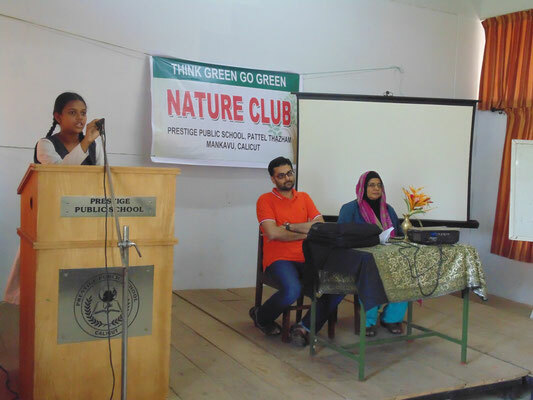 The Green Wave is a global campaign the Secretariat of the Convention on Biological Diversity (SCBD) has been calling for to educate children and youth about biodiversity. 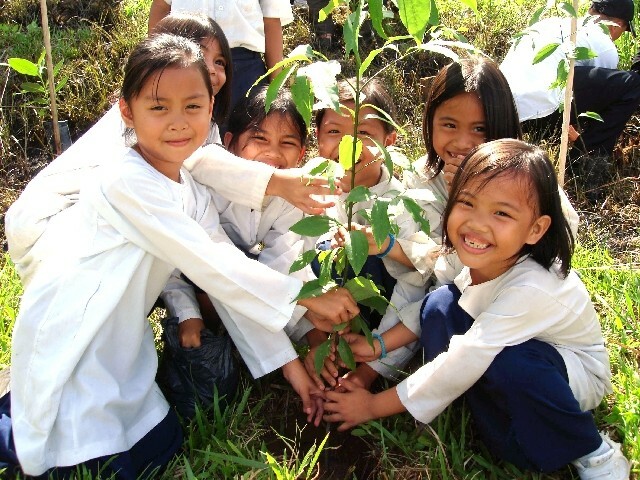 On the International Day for Biological Diversity (May 22), children and youth plant trees at 10:00 local time in their respective schools and communities, thereby spreading green waves worldwide. Lovely greeting cards from CFP children arrived this year again! We can see wonderful drawing and messages. Here are some of the cards that OISCA HQ received from CFP participating countries. The National Workshop 2015 of the Children’s Forest Program (CFP) was held in Nueva Vizcaya Province on February 15-17, 2015. A total of 105 people including children participating in the CFP, school teachers and coordinators from all over the country, came over to take part in the workshop. Under the main theme: “Being a Catalyst of Change in the Community: 21st Century Skills and Youth”, lectures by coordinators and specialists and also other programs such as nature observation, environment poster-making, nature games were conducted. Many people around the world are faced with natural disasters such as floods, droughts and yellow sand. 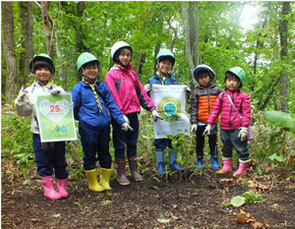 Against this background, OISCA, a Japanese NGO for international cooperation with its headquarters in Suginamik-ku, Tokyo, has been carrying out the Children’s Forest Program (CFP) comprising tree planting and environmental education activities for children worldwide. 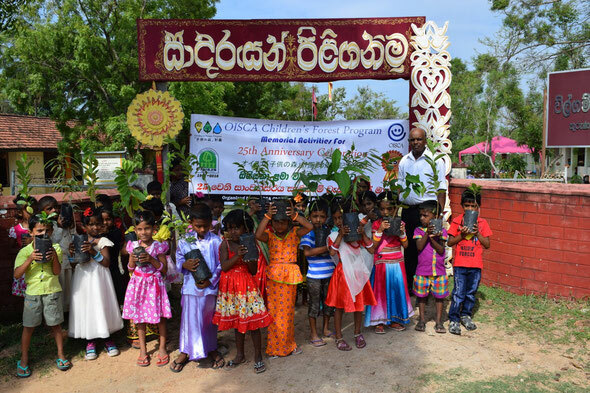 From September 4 to 14, OISCA is inviting to Japan a group of children from Sri Lanka and Thailand who are actually planting trees and learning environmental issues in their own countries. PRESS RELEASE　"Story of World Forests"
The first workshop was conducted in Myanmar in 2012, and in response to its popularity, the second one was carried out in December 2013. The 5-days and 4-nights workshop was held at Myanmar Agriculture Service(MAS) OISCA Agro-Forestry Training Center. A total of 42 school children from 17 schools in Pakkoku District taking part in the Children’s Forest Program (CFP), gathered and learnt the nature of the community through agricultural experience and playing games in the forest located in the premises of the Center. 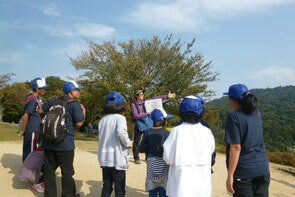 Also, all the participants climbed Mt.Sinma which is situated near the Training Center and conserves the rich nature. 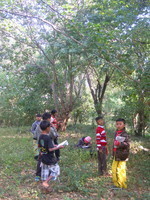 The staff divided the children into 6 different groups, thoroughly observed the species of trees and plants in the forest. 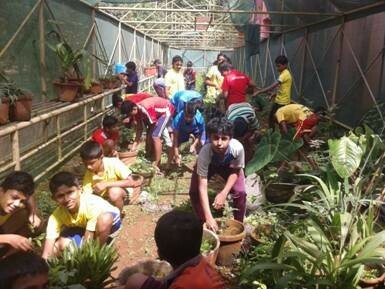 Through the activity in which the participants looked for the same kind of leaves as the ones handed over by the staff, the children fully utilized their body and feelings and felt closer to the Nature than usual. 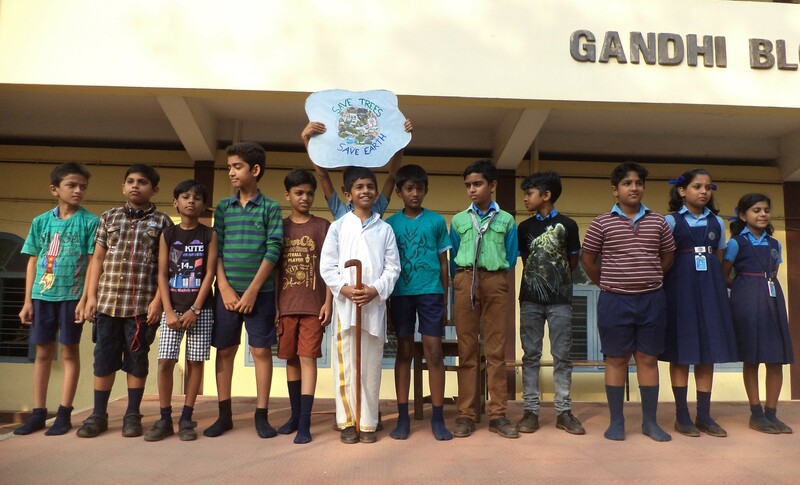 More than anything, they were very stimulated in spending time together with children from other schools with whom they usually don’t have an opportunity to meet and talk each other on their respective activities and daily lives. We intend to continue to organize this sort of eco camps as an initiative to generate a new willingness for inter-school communications and CFP activities in the future. 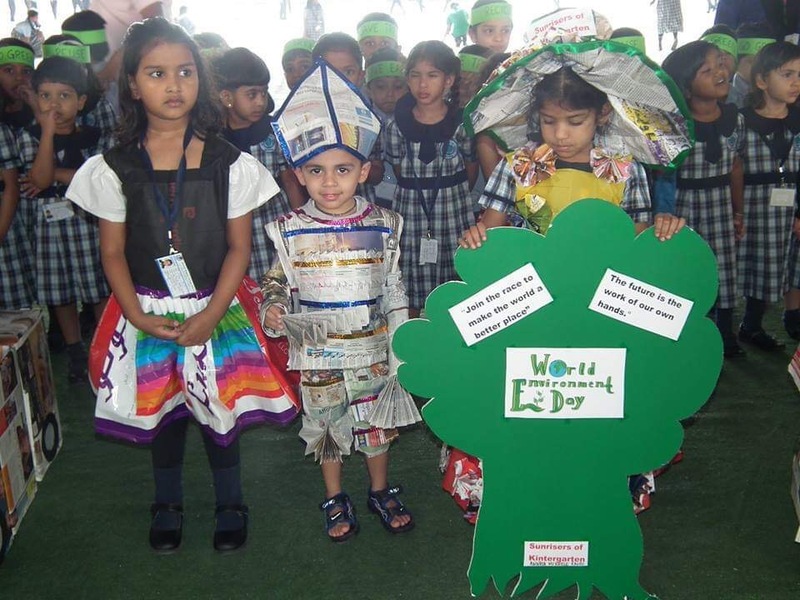 OISCA’s Children’s Forest Program (CFP) has been also taking part in the campaign since 2009, and the number of participating schools and countries is steadily increasing. Indonesia, which has participated for the fourth time, is particularly active, and about 2,000 school children and young people from 60 CFP schools and organizations such as youth groups and orphanages took part. In the activities, former OISCA trainees in cooperation with CFP coordinators, worked hard for spreading information by utilizing social networking service such as Facebook. 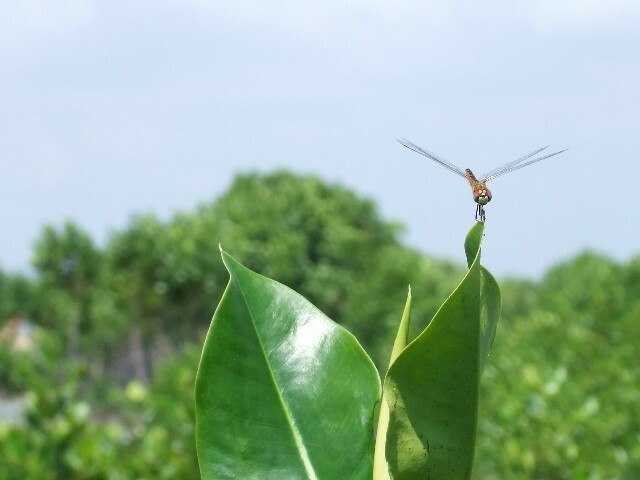 In the tree planting conducted in Indonesia, seedlings of local species and rare species were planted to protect biological diversity and to prevent the extinction of species. At the No. 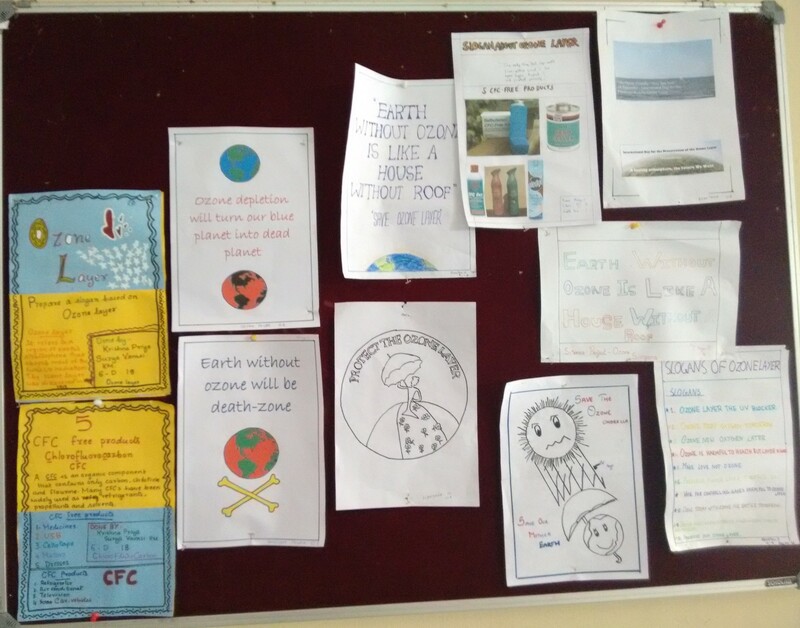 1 Parungkuda Hich School, which has been promoting CFP activities through an eco club on a regular basis and has a keen interest in global warming and environmental issues, the Green Wave has become an annual event. 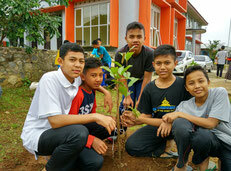 After a simple ceremony, the students and teachers planted seedlings of fruit trees called Tangkalak, rare species of the Sukabumi area. 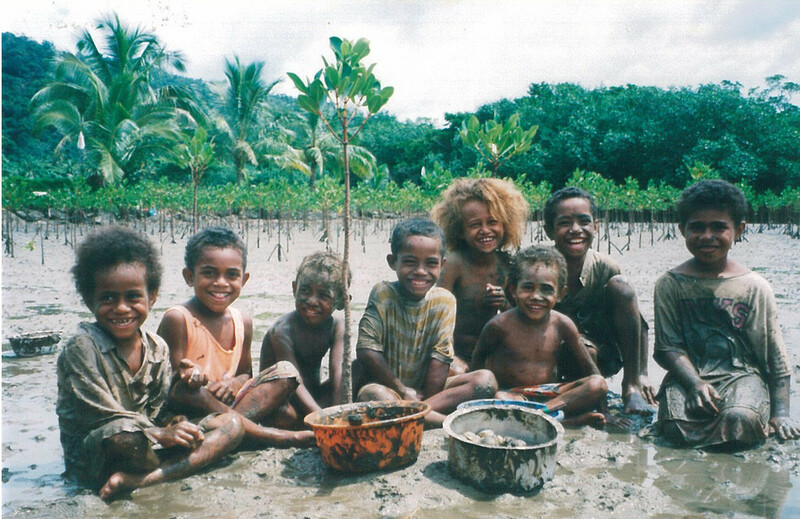 Planting the local species is a good opportunity for the children to get familiar with the natural environment of their community and taking care of the planted seedlings is leading to foster awareness for protecting Nature. Besides, there are an increasing number of schools and organizations which are carrying out, not only tree planting but also a variety of programs such as nature games, echo seminars and trash collection, and there are growing expectations of the future development. The details of the OISCA Green Waves conducted in the various countries are published on the CFP Facebook. Please do have a look at the site. 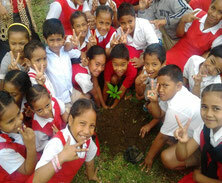 The CFP activity implemented at two schools in Tonga, the islands in South Pacific Ocean, in September, 2013.Finau, ex-trainee in OISCA Shikoku training center and Toni, ex- trainee in OISCA Chubu training center started the activities in this country. 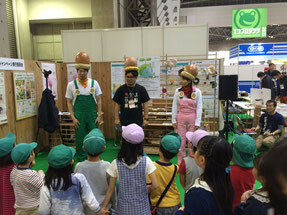 Although they’re living in different regions, they started to teach children the importance of benefits of the forests and the meaning of growing plants in their “Furusato,” utilizing what they learned in Japan. On the other hand, OISCA senior trainees also make efforts in Mongol which is located in the north of East Asia. 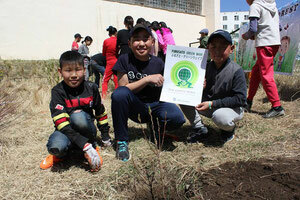 The planting activity was implemented for the second time at the elementary school in Bogotá district and kindergarten in Erdenetcity in May 12, 2013 observing the country’s “National planting day”. This time, original educational materials for teaching the natural environment and connection of living creatures in Mongol were newly created. 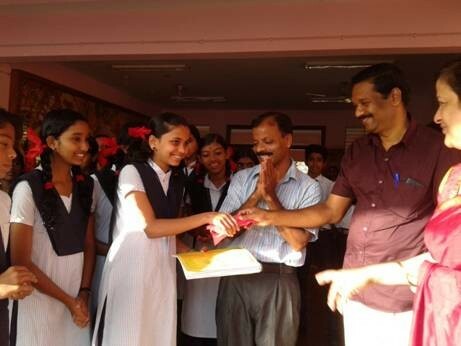 These materials were distributed to the school children. 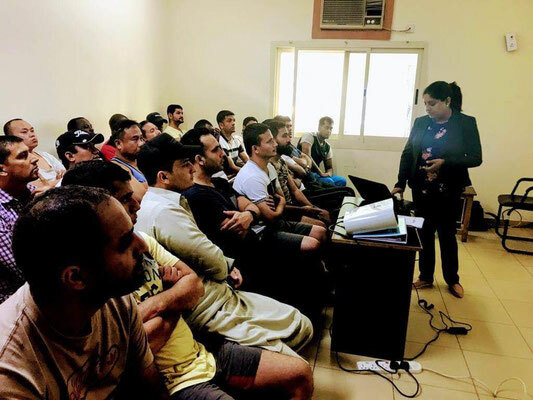 Even though the activities in these countries are experimental and small-scale, the youth OISCA have educated are playing role in the activities for the next generation in each of their “Furusato”. November 2013, super typhoon Haiyan hit Bisaya area, Philippines and claimed so many lives and caused great damage to farm land, forest and fishing grounds. Schools which used to join CFP in Leyte Island, Negros Island and Panay Island and the forest that children have been taking care of were also damaged. On the other hand, we could hear that local people telling “Damages to the villages by the rain storm and tidal waves were mitigated because of the forest”, “The fully grown trees helped us to build temporary school buildings which replaced the completely destroyed ones”. School building is seen behind. 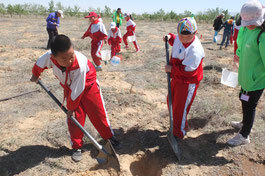 Tree-planting is necessary for protecting children’s Study environment. 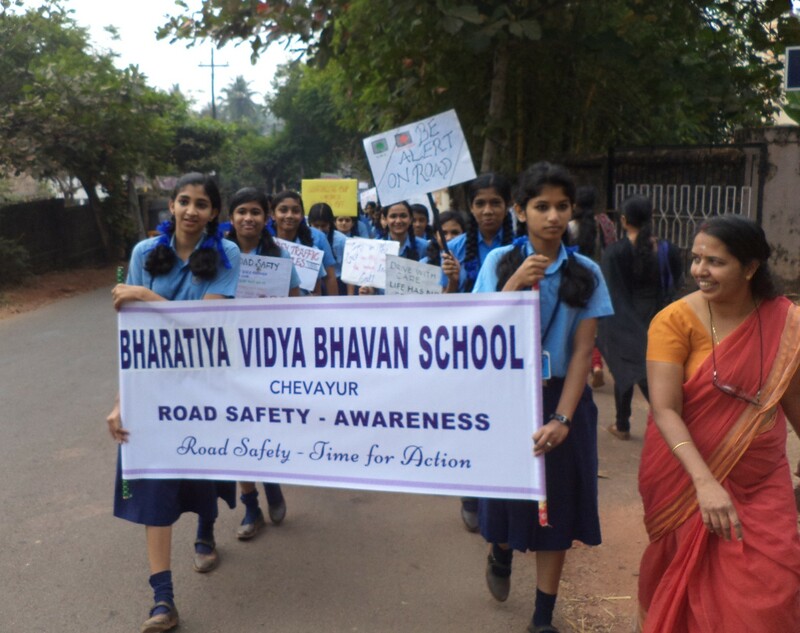 This school started CFP activities in 2013 when the CFP coordinator called on. Previously, the school grounds were dreary vacant lots. So, the first thing the coordinator did was to distribute seedlings for tree planting. 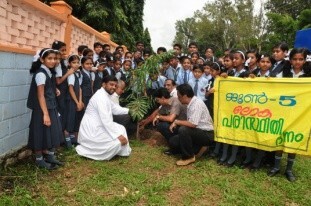 The children were very excited about the first tree-planting. As with the case of many other schools in Bangladesh, their tin-roofed school buildings get very hot when exposed to the sunlight, and turn into tough environment for the children. They plant seedlings and take care of them, and are anxiously waiting for grown trees to provide shade blocking the sunlight. The river seen behind, often floods. 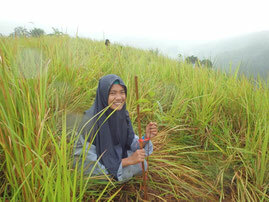 They plant seedlings in praying for protecting their livelihood. This school has been paticipating CFP activities since 2004. 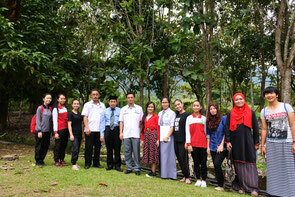 The Principal, who is an advisor of mangrove planting, is very active in carrying out the activities. 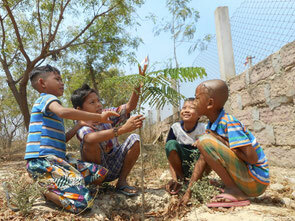 The main species that the children are planting are mahogany or acacia which can be utilized as lumber. The trees planted around the school buildings and the dormitory are growing big, provide good environment in the form of shade and fresh air, and also are useful for improving school equipment such as tables and chairs for the children. Hello! I will introduce how I spend my days. 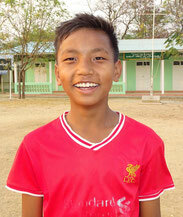 I am Sudarat Urai, a fifth grade at Banchoktai School and I have been participating in CFP. My friends call me Paeng. It takes 20 minutes for me to come to school by bicycle. Class starts at 9am and ends at 4pm and lunch break is between 12pm and 1pm. School lunch is served at school so we only bring rice from home. Our class teacher loves to teach and always make classes enjoyable. In the future I want to be like my teacher who enjoys teaching many children. Children looking at worksheet and learnning how to plan trees. Banchoktai School is located in the center of the village and there are forests and rice fields in the back. 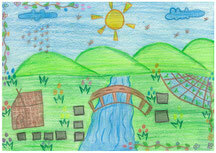 They have been interested in environmental preservation activities and joined the CFP. Unfortunately, there are no wide places for planting in the school site so the first thing to do was to implement a workshop of environmental education aiming to make the children understand the meaning of planting trees. 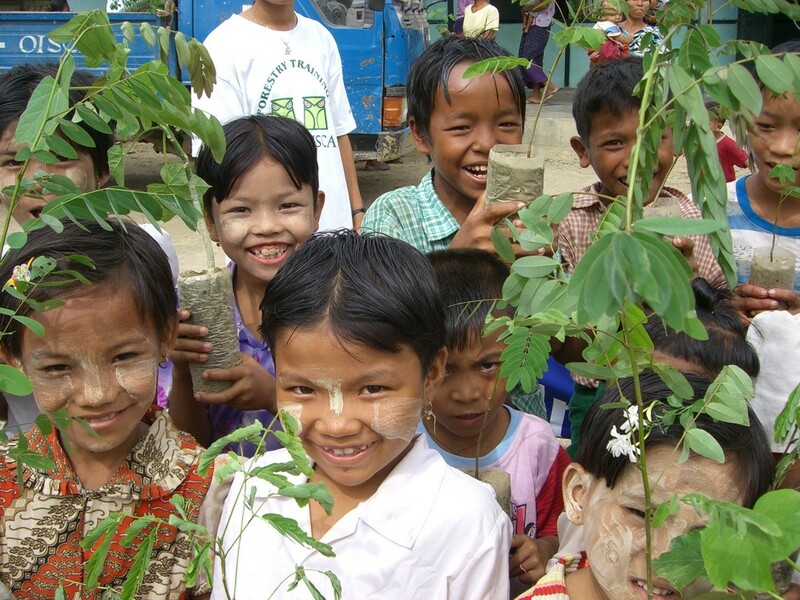 And then, children started planting at their homes or the roads along the rice fields. Since most of the village people make a living by agriculture, they started organic farming. We are planning to develop various activities such as cattle rearing and rice cultivation while continuing planting activity at the village forest and the temple. We hope that children will experience how humans live with nature and understand the importance of preserving it by learning organic agriculture.